After 120 mill later on the anacoda upgrades the interdictions are still just as overpowered. I was waiting to test out all the upgrades, and how fast it would shred him with dual beams, dual multi-cannons, dual pulse, full compliment of ecm, chaff, boosters. Was just about murdered two times before I could jump. I can take my vulture or python to a conflict zone and wipe the floor with them but not on interdiction. 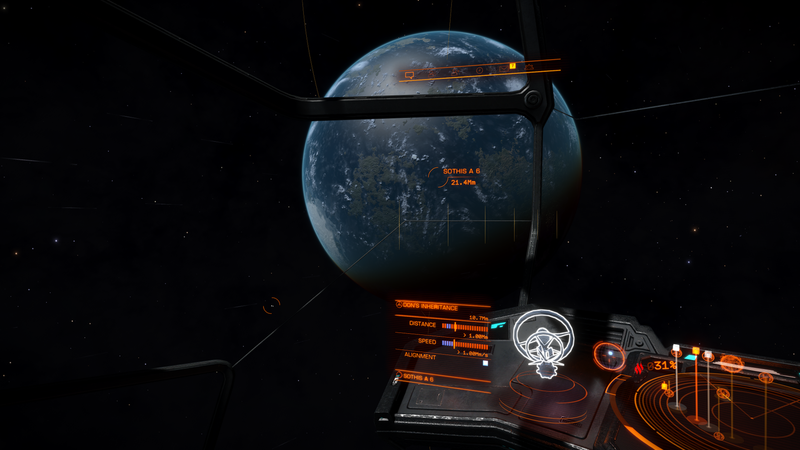 I called my type-9 in and will just have to jump at any the first sign of glad I found you. 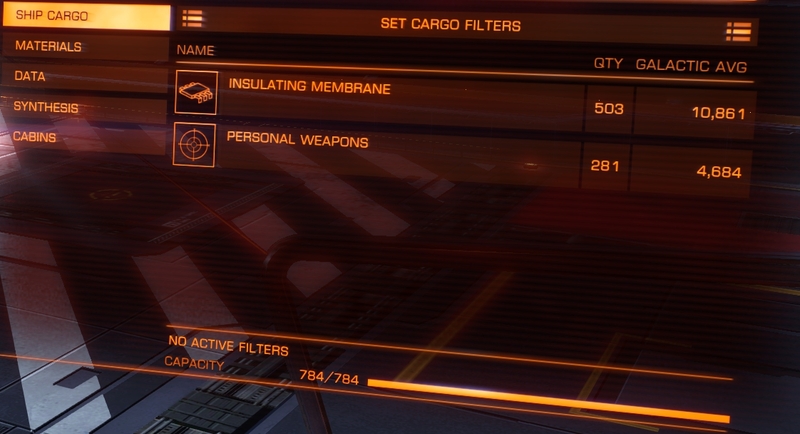 I think the type 9 is best for these new 5-7k missions, 2.8 million just to transfer from 480ly. No strut shaming in eh. That's why most of us don't plan on interdictions without being armed for bear. I spent 120 mill on upgrades but I just don't understand how they eat through my shields in in about 15 seconds. I just saw your posts jwh1701, nice pics. Nice to hear you guys trying out ED again recently and welcome to the game ShoShasi. Hmm, are your shields and shieldboosters partially engineered jwh? I'm just guessing but maybe you need to have some more thermal resistance added to your overall shield resistance(?) Also a fighter pilot npc can sometimes be helpful when making a retreat or just used as interference to help against a tough npc ship. And the level of npc pirates gets higher the higher your combat rank is. So if you've done plenty of CZ's in your python and moved your combat rank up, you'll likely get tougher npc interdicting pirates. Also since Beyond 3.0 (around Feb.), the npc opponents have been upgraded and more are using engineered weapons of their own and varying weapon loadouts and maybe a few new different ai tactics. Yes, I had heard maybe the interdiction duration could have been changed. I've usually submitted and fight off the npc pirates these days now in my cutter so I may be too safer in my cutter's shield shell with almost all engineer upgrades done. (The cutter with shields of course isn't invincible. Two hard-hitting vultures (or a corvette or anaconda) can wreck a cutter in a few minutes if it's just sitting there. FDev have done a decent job balancing and tweaking the overall combat modeling, imo.) However, the anaconda is thought by some to have the best weapon fire convergence of the big three. And just getting some G3 upgrades for the shields and boosters should be marginally good enough to resist the interdicting pirates longer, maybe. For myself, recently in ED I've just been doing cargo runs for some allied factions in select pledged space for my cmdr. And enjoying the vistas as I make the trips. My rebuy for my cutter is costly (35mll) so I try to keep safe and retreat if my shields are down and it's getting nasty. I also tried the Krait last month and the rebuy is much less after upgrades. (~ 8mil) Well, I mostly enjoy flying the cutter because it's the most like a heavy airliner and I was a FSX /w pmdg.com nut fan before ED. I think FDev have been improving the visuals through this Beyond year gradually. Looks better all the time. I just saw your posts jwh1701, nice pics. Nice to hear you guys trying out ED again recently and welcome to the game ShoShasi. Thank you for the response, I worked on getting hcs, mk connector working today. Back when elite was first released the bulk of what I enjoyed was running long runs ore. I got to elite rank with using the sidewinder then to a python mostly doing robigo. Back then I rarely remembered getting interdicted but after EH and then the engineers update I was getting killed a lot and I got frustrated with the game. My priorities have changed and I would like to be able to find profitable routes as I would like to rank up in imperial and get two cutters, one for exploration/cargo. I would love to be able to outfit my other ships but at the rate I amass CR its painfully slow. I wasted a lot of CR always playing around with ships in the high conflict zones. Even using MK, or route tools I have never been able to make enough credits to do really have fun in the game. The wing missions are interesting but that would require online play so I not to sure about that. I remember many talking about clans that were dedicated to griefing so I never go online. Here's my current stats but I rarely see the 2/5 mill easy missions like youtubers, only seen one 45 mill mission but it would have taken forever to complete due to supply. Appreciate any advice on how to find routes now. I left CEOS today and went all the way to Abetti Vision, Kirby etc, to try my luck at ranking up with the Empire. I can not find any decent one hop missions for the type 9. Hardly interdicted on the way and just got 7 in a row, two doubles, 3 singles trying to get to Abetti. 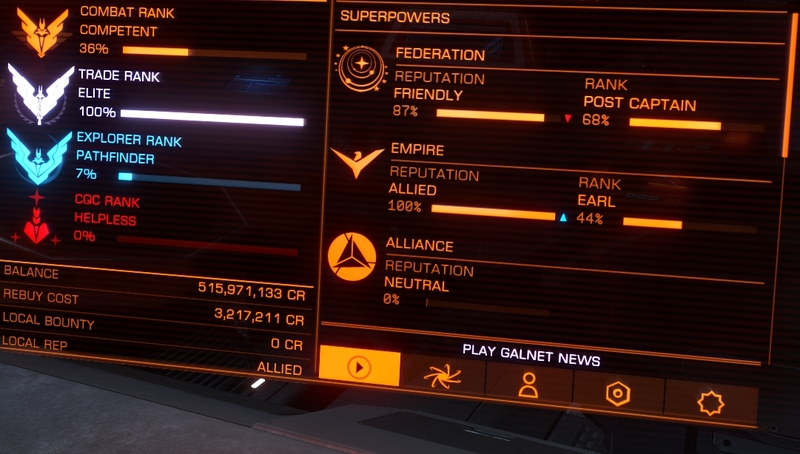 Hi jwh1701, congrats on making Elite trader from sidewinder to python. Sorry I'm not sure what you mean by "two doubles, 3 singles"? Did you mean interdictions? Do you also know about the 75% throttle tip on approaching a station? When you get to within 30 to 10 seconds, no more than 6 seconds, you can set your throttle to 75% with a customized hotkey and then it won't overshoot the rest of the way on approach before supercruise exit point. You can also set it to 75% throttle a thousand Ls out if you want and occasionally adjust the bearing of the ship back on target. I've played probably much longer than average as ED is the main game I've played for the past almost three years. Well, I've almost never went to credit hotspots as reported on yt, so I went about it a long way, but perhaps there are some ideas I can suggest for your ED goals. I'd suggest choosing a few factions and local systems to build up rep with to get up to allied or friendly. If you are fed aligned you could find systems near the border with an imp power or vice-versa using the powerplay galaxy map mode. Transporting passengers also pays well when allied and if there are destinations farther from the sun in a system. Here's an example of a system I'm currently in. You can see some missions are winged but some have less than 1500 tons to transport, so I'd think they could be doable in a T-9/T-10 or python/Krait in a few round trips. 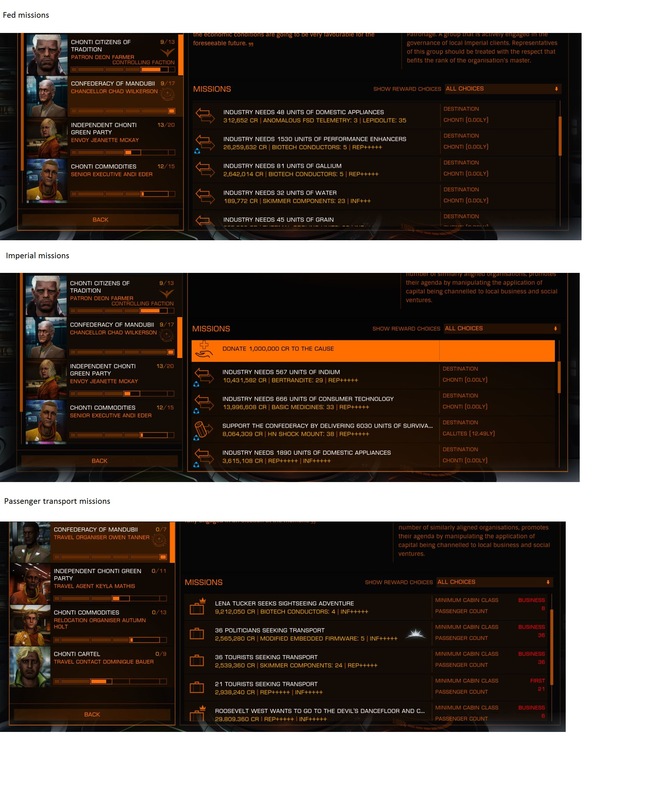 As you can see there are a few missions paying more than 10 million asking for < 700 tons in sourced donation commodities. You may see different missions in solo mode. So what I'd suggest is to make up your own private group from the main menu. Then you can play in pg mode and it's pretty much the same as solo if you don't have other cmdrs currently in the group. Also doing some donation credit missions with the target faction can help build up both rep and fed/imp navy rank, such as the 50k, or occasionally the 300k, 450k ones. The road to riches is pretty interesting, no surprise someone is in that thread calling this an exploit. I got so tired of the core group that believes everything should be a grind. Looking at the anaconda or cutter, outfitting is so depressing when i think how long it will take to get the wanted upgrades. I going to backup my game pc and reload win10 and try a few experiments to see if I can implement some changes. It's a grind. But that's the whole point. Looks cool, imo, reminiscent of the design style of "V'Ger" in Star Trek I. They did not give much to go on, I would like to see new more powerful additions above the guardians. I was stuck home yesterday and found better missions with the python, no fuel scoop and 280 cargo. the ship at full speed, I did finally fully upgrade the anaconda, setup all the hard-points added two torpedoes thinking I not going to miss out on the promotion. Got to the system deployed the ai fighter, found my target wondering how hard this is going to be. I laughed quite bit at my overkill because the poor guy was in a cobra, fight was over in probably less than 20secs. Some guy was planning to sell all his ships to buy an Anaconda. And we were all like, "wot? you better have money to spec it to the hilt or you're f-cked"
have. I moved the python, vulture, type 9 and anaconda down to the empire to work on rank. But the most profitable ship is the python at the moment by a long shot. I continually find 5-11 mill boom time missions that most are below 100 and quite a few below 50t. somehow did 8k hull damage just going straight up. No shield no fuel scoop nets 784t.